Well, you could always buy a copy of Adobe Acrobat, which is actually designed solely for the purpose of creating and editing PDF files. Or you could import the file into Calibre, convert it to ePub format, edit the ePub to add the table of contents, then convert it back to PDF. There are other free tools for working with PDF directly. If you do a Google search, you would find this page which lists several free tools for editing or modifying PDF in various ways. 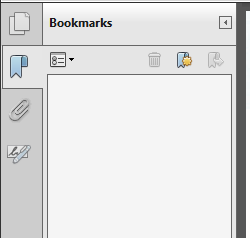 I have used jPdfBookmarks on both Windows and Linux to do exactly what you describe - create your own bookmarks. Find it here. I will extend on @Donald's answer but I would also like to note I do not recommend, personally for quality issues, ever using Calibre for ebook development. 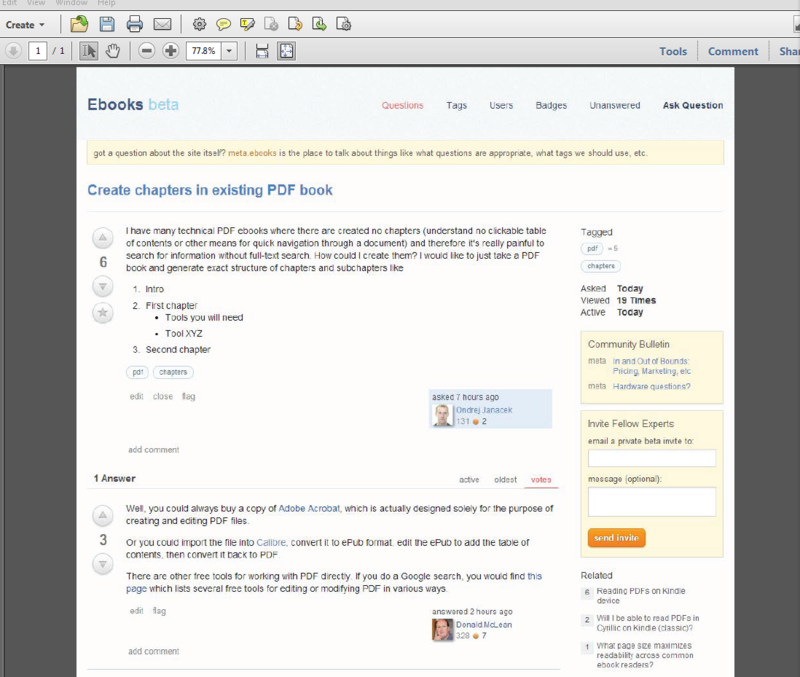 There are also free tools that allow editing/adding bookmarks. A cross platform example is jPdf Tweak. It is a little clumsy to use, but you can create the table of contents in your favourite spreadsheet program, export as csv and then just import it. I am used to a simple and free tool that adds clickable bookmarks to PDF or DjVU files: http://handyoutlinerfo.sourceforge.net/. 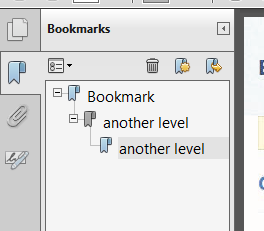 You first have to prepare (and import in the tool) bookmarks entered in a text file as an indented list of labels and pages. 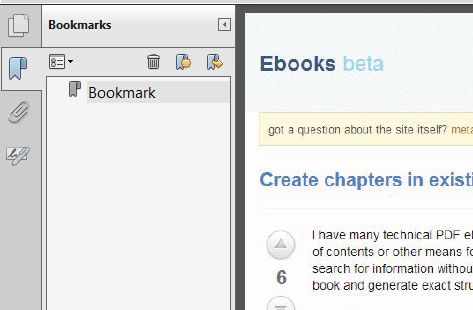 Then the tool creates them in the document as bookmarks you can open/reduce and click on using the left panel. There are some good options such as shifting all page numbers first with a given constant. This is useful when the prepared file is actually a copy/paste extract from the table of contents existing (but only as text and without bookmarks) in the document: as cover, preface, introduction, ... are generally numbered separately. ...where my_chapter_list.txt is a simple ASCII file with page numbers beginning each line, e.g. You can OCR the TOC and use regex to fix it. Your can read its manual or watch a quick video tutorial. It has command line mode and can work on Linux, Mac. The full Adobe Acrobat Pro ver.8 is available as a free legal download from http://www.techspot.com/downloads/4683-adobe-acrobat-8-free.html for both Mac and Windows. Sure, it's not the latest version, but free is good, and it works just fine for adding or editing a table of contents. Foxit Reader, Xodo are possible options. 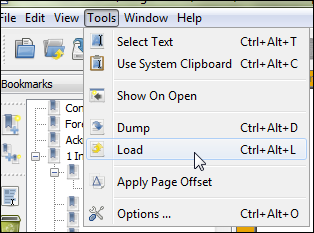 You can learn almost everything about editing PDFs and many other possible PDF Editors via this guide to editing PDFs. Not the answer you're looking for? 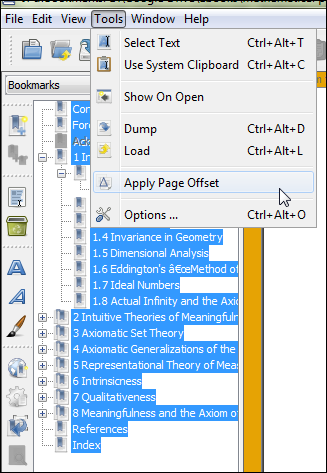 Browse other questions tagged pdf table-of-contents hyperlinking chapters or ask your own question. How easy is it to add a table of contents to an epub book? Is it possible to add a Table of Contents to a CBZ file? Epub without a Table of Contents, is it possible? Why am I getting spurious TOC entries in Calibre?